Brantford – After a year of consultation, planning and design work, Moriyama & Teshima Architects unveiled plans for the redesign of the Market Square property in Brantford at an open house today. 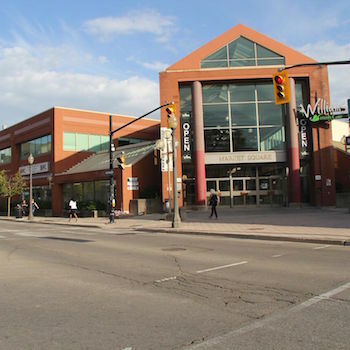 Purchased from the City of Brantford by Wilfrid Laurier University in 2014, the former shopping mall will be transformed into new academic, cultural and service spaces to support continued growth at the Brantford campus. As a net new addition of space, Market Square has the potential to double Laurier’s footprint in Brantford. The Brantford campus has a current enrolment of about 3,000 full-time and part-time undergraduate and graduate students. The concepts created by Moriyama & Teshima allow for two major phases of redevelopment that will prepare the university to reach its next milestone for enrolment growth to 5,000 students and a further, future milestone of 8,000 students. Moriyama & Teshima’s mandate included a clear directive to reflect Laurier’s priorities, including: a campus that is fully integrated into downtown Brantford; a respect for the history of the area and the community; support for the expansion of postsecondary education for Laurier and its postsecondary partners, including Conestoga College; and to continue the remarkable revitalization of downtown Brantford that has resulted from the long and productive collaboration between the university and the city. To help inform its design work, Moriyama & Teshima consulted in depth with Laurier students, alumni, staff, faculty and community before coming back with their proposed concepts. The result is a mixed-use facility that opens itself functionally and physically to its urban surroundings. One of the anchor features of the site will be a library and learning commons, as well as creative and commercial spaces.